The manifestation of the Passion power of Jesus Christ at Adoration Ministry Enugu Nigeria during the just concluded Good Friday and Holy Saturday programme of the ministry, is a poser for those who thought that resurrection power was a mere historic narrative of what happened to Jesus Christ some 2018 years ago.The two-day programme which was tagged Good Friday / Holy Saturday of Healings, deliverances and miracles was hosted by the Spiritual Director of the Ministry Rev Fr Ejike Mbaka. The Miraculous manifestation of God’s power demonstrated at the programme left numerous worshippers who partook in the programme with goose-pimple arousing testimonies, as they narrated their encounters with the power of God. Rev Fr Mbaka’s ministry has been replete with many miracles that go unannounced by the contemporary media that would rather seem to wait to blow Fr Mbaka’s rare political comment out of proportion than report such consistent miracles that take place in the ministry on daily basis. It has been found from research that one secret of the crowd that follow Fr Mbaka was the genuine testimonies on the lips of each and every member of his followers. Quite unlike the case with many worship centers today where fake and make-belief miracles are used as a weapon for advertisement, one condition for those giving testimony at Adoration Ministry ground is that the testifiers must disclose their identity down to their villages and also drop their phone contacts for anyone who cares to verify their authenticity. Other secrets behind the crowd that follow Fr Mbaka is the unequalled wisdom and power of the Word which Fr Mbaka commands, his hyper meditative intelligence, originality of worship, and accuracy of prophecies which hold his followers soul bound. His charity disposition and compassionate attitude to the needy which are all part of the secrets will be a topic of discussion for another day. 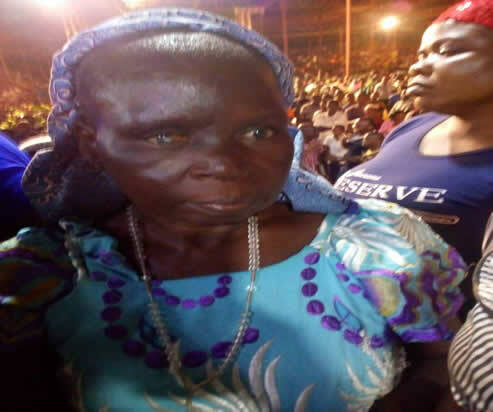 First was One Mrs Faustina Ude an elderly woman from Ezeagu, Udi LGA of Enugu State who turned blind since 2012 after having strange migraine headache. It was such a strange sight watching the woman whose two eyes where pale (without the black retina almost pale) moving round the altar alone without and guide or help. 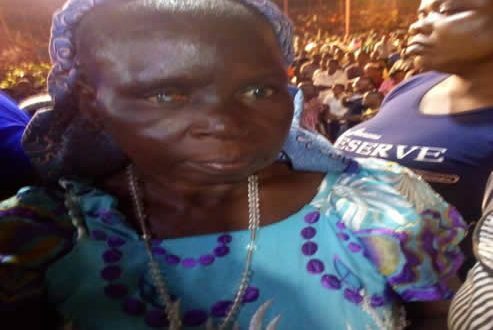 She testified that she was brought to the programme because of her blind situation and that during Fr Mbaka’s ministration she felt something like a scale dropped out of her eyes and she regained her sight. The physical look of the woman’s eyes left no one in doubt of her situation yet she testified that she could see everything around her clearly. In Confirmation of her testimony, Fr Mbaka asked her to identify some colours and objects at the altar and this she did perfectly. His son and some other people who knew of the woman’s situation were also there to collaborate her testimony. That was not all, one Ossai Malachy from Enugu Ezike ,Igbo eze North LGA of Enugu state testified that sometimes ago while cleaning his ears, the wool inadvertently fell of the stick and the hard stick pieced his left ear, the result of this was the deafness he developed then after. He had lived with this situation until that Good Friday when his ears opened again during Fr Mbaka’s ministration and he could hear again. Again one Rosaline Okafor from Enugu Ukwu in Anambra State who gave her phone line as 08107036527 testified that for over 5 years, she had had strange rashes all over her body that used to itch her at all time and made her uncomfortable. Of course looking at her, one could see the callous look of her skin evidencing the rashes and the scratches. 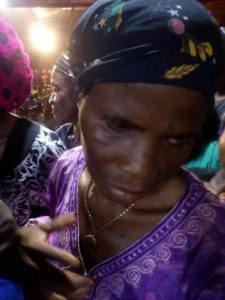 She testified that when Fr Mbaka asked people to hold the ailing parts of their bodies during his ministration, she held her body and instantly felt something like cold water running from her head to her toes and that was the end of the itching she used to experience. She wondered that from that moment to the time she was giving the testimony, she had been at peace and has not scratched any part of her body. Moreover Ukwueze Lillian Ngozi from Ikem in Isi uzo LGA of Enugu State who gave her phone line as 08064921030 testified how she was healed of her over 7 years of heart problem . According to her, “it all started the day I did my traditional marriage, that was about 7 years ago. I was hugged by someone and after that I started experiencing pains in my heart. I was hiding this problem initially but when it continued I had to go for a heart and Liver X-ray where the problem was confirmed. I still have the xray pictures in my house. I was practically living on drugs and each time I eat, the food would not digest unless I take the drugs. I am not a catholic but I saw Fr Mbaka in my dream and told my husband that I have faith that if I touch Fr Mbaka’s garment, I would be healed. In November last year I slumped and it took time for me to me revived. After that I started coming to Adoration progarmme. On that Good Friday while at the Adoration ground , the heart pains started again , I could even feel my heart swollen and felt so weak that I couldn’t stand up, but after Fr Mbaka’s ministration I felt a strange energy in my body, I couldn’t feel the pains any more, I felt so free and whole. I couldn’t understand it, I went and ate food and was surprised to discover that the food digested without my having to take those routine drugs. I have no need of the drugs any more as since then till now, I haven’t felt any trace of the ailment again in my body. Futher more Okorie Chinwe Blessing who gave her phone no as 07064564365 testified that in the year 2013 when she went from her WAEC Examination, she saw a mango and wanted to plug it and in the process her right arm got dislocated from her shoulder and twisted. She did all she could to return her hand to its usual position all to no avail. She was rushed to hospital where the hand was returned to its position but after that she could neither lift the hand nor move it freely. According to her, during Fr Mbaka’s ministration on Good Friday, she felt a heavy burden lifted off her shoulders and she began to move and lift her the hand freely without feeling any pains. Eze Onyekachi from Ihakpu Awka in Nsukka who gave his phone line as 07067300520 testified that when he was tender, he had a problem with his left hand after he had immunization. As he grew up, the problem continued that he had to go for surgery in Togo. After the surgery, he couldn’t lift his hand up and as a result he had to come back to Nigeria. It was back home that someone advised him to go the Adoration, He came that good Friday and during Fr Mbaka’s ministration, he felt the pains in the hand vanished and he could move his hand to all directions effortlessly. Ugwor Francis from Uzouwani who gave his line as 09060428199 testified that for up to three years, he had arthritis and as result he couldn’t not walk freely. But during Fr Mbaka’s ministration, the pains in his leg disappeared and he could walk freely. Dike Martina from Awgu gave her line as 07034375102 and testified that she had a severe waist pain and it made her not to walk at all. According to her this had lasted for over 20 years and she had been carried to many places all to avail. She was taken to the programme on Friday and during Fr Mbaka’s prayers for the sick, she got her healing. Mrs Akpamgbo Jenifer from Enugu Ukwu ,Anambra State who gave her phone as 08068459255 testified that since December 2017, she started feeling sick all over her body and sometimes she would be feeling as if she was fainting. She had lumps in her belly and used to experience one illness after another. But during Fr Mbka’s ministration, she notice something like a chimpanzee leave her body and all of a sudden she felt cool all over her body and all the illness she used to fell disappeared strangely. She said she had been searching for the lumps in her belly and could not find it since then. At the time of this report AMEN Super news is still compiling the records of those who gave testimonies at the programme to be published subsequently. It should be recalled that it was during the Good Friday programme of the ministry held this season last year 2017 that the ministry recorded the miracle of the opening of the mouth of one Esther Ugwuoke who mysteriously turned dumb. Esther was the house help of the Immediate Past President of Association of Resident Doctor’s of Nigeria, Dr John Ugochukwu Onyebueze.